Brownies usually aren’t my thing, but I had to make morning tea for work tomorrow and decided that chocolate decadence was going to be the only suitable option to get us all through the day. I searched for a while to find the right recipe that had some good ingredients in it, and not just copious amounts of white sugar, flour and butter. 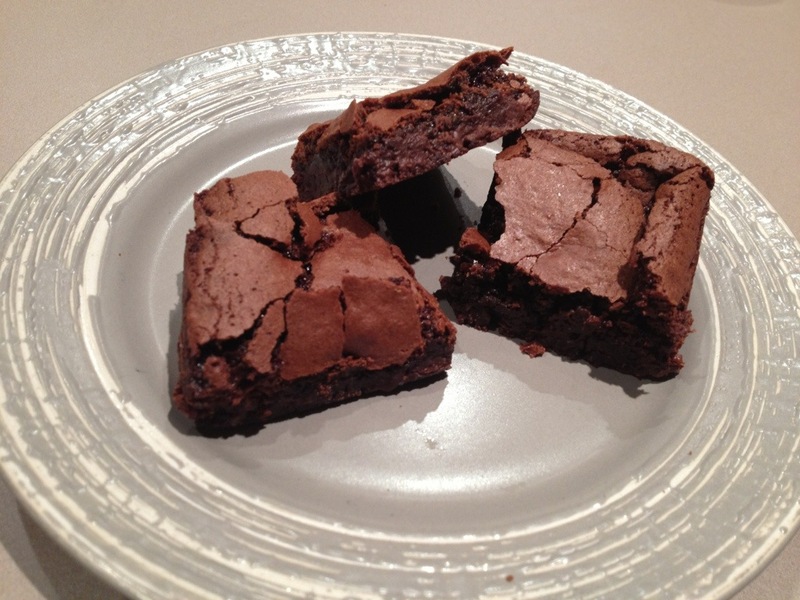 I found a recipe (original here: http://www.passionateaboutbaking.com/2012/12/baking-wholewheat-dark-chocolate-brownies-one-bowl-whole-grain-and-delicious.html) and decided to base my brownies on that, adding a few of my own twists to make it slightly healthier still. The end result was blissful chocolatey goodness. The outside crust is crunchy and light, while the inside is soft and chewy. I’ve eaten four already, so needless to say I’m now a brownie convert! I’ll definitely be baking these again and will no doubt divert from the recipe slightly. Some awesome additions would be macadamia nuts or slivered almonds, toasted coconut, sour cherries, fresh raspberries, blueberries, mashed banana, glacé ginger or chopped dates. 1. Preheat oven to 180 degrees celcius. Grease and line a 20cm square tin. 2. Put dark chocolate and oils in a bowl and microwave for a minute or so until melted. 3. Whisk sugar into chocolate mix. Add baking powder, salt and eggs and whisk. 4. Add flour to mix and whisk until combined. Fold in chocolate chips. 5. Spoon mixture into tin and cook for 18-22 minutes or until middle is set. 6. Let brownie completely cool in tin before removing and cutting into 16 squares.